That didn’t take long. Just twenty-four hours after Cult of Mac first reported that a jailbreak for iOS 6.1.3, 6.1.4 and 6.1.5 was incoming, it’s here, allowing even iOS 7 holdouts to get in on the jailbreaking fun. 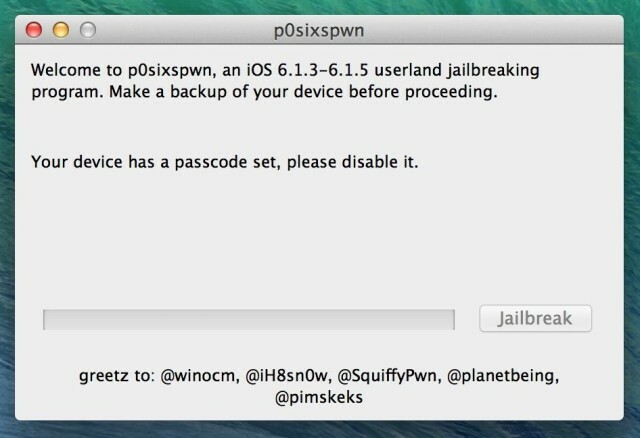 Developed by iOS hackers ih8snow, winocm and SquiffyPwn, the new jailbreak tool is called p0sixspawn, and it will crack wide open any of the final three versions of iOS 6: 6.1.3, 6.1.4 and 6.1.5. Although Team Evad3rs successfully released an untethered jailbreak for all versions of iOS 6 up until iOS 6.1.2, Apple closed that jailbreak hole with iOS 6.1.3, leaving any potential jailbreakers between that version and iOS 7 stranded. The release of p0sixspwn is a nice Christmas present to those who want a jailbroken iOS device but don’t want to upgrade to the radically redesigned iOS 7, either because the dislike the aesthetic or because it runs poorly on their device. You can download the tool from the official website, and despite earlier reports, it will work on both OS X and Windows.